If you've never decoupaged before or just have some questions, use this resource to learn how to Mod Podge. Includes FAQs, videos, how-tos and more! Do you want to learn how to decoupage? 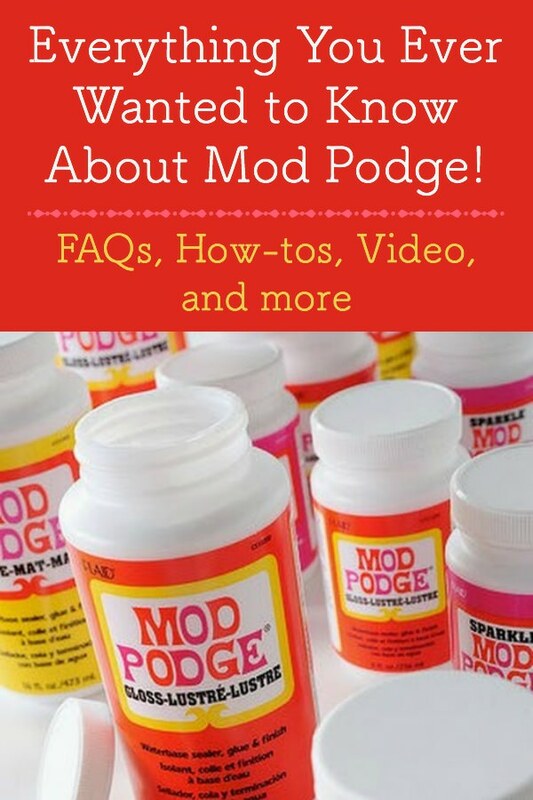 Here are my Mod Podge videos, and below that, a complete FAQ. I suggest printing this post and settling into a bubble bath – it's lovely reading! If you are a beginning Mod Podger, GO HERE and watch all three beginner videos. If you are having issues with bubbles and wrinkling, watch all three videos. If you have a tacky project surface, spray it with clear acrylic sealer (several coats) and it will go away. Then watch all three videos. I've compiled a list of 101 Mod Podge uses that I think you have to see before you begin. It's going to get you excited about the possibilities, and then you can keep these uses in mind as you go through the learning process! The FAQ is below. Is Mod Podge really Elmer’s glue? No. MP can glue things down, but it is also a sealer and a finish. It has “special” ingredients that school/craft glue doesn’t have. It’s much stronger than Elmer’s, especially over the long haul. Read this post about why you shouldn’t make your own Mod Podge. No. it is waterbase and acrylic, which is great because that means it’s non-toxic. You can use it with your children without fear. But all these things mean that it’s not totally waterproof. Even the Outdoor formula is only highly water-resistant. If you want to make your project waterproof, I recommend a clear, outdoor (or Enamel) acrylic sealer when your project is complete. Make sure that the final layer of decoupage is completely dry before spraying. 1) The Outdoor formula has been extensively tested and is very durable in outdoor conditions. It’s pretty close to waterproof, but you can’t throw an item with Outdoor on it into the pool and keep it there for three weeks without ruining the project. To be able to do so would make it waterproof. 2) If you get a few drops of water or moisture on a Mod Podged item, just wipe them off. You can also use a slightly damp cloth to clean a decoupaged item. Again, the formulas are very durable, just not waterproof. What is cure time for Mod Podge (how long should I let it dry)? It feels dry within an hour, but I wouldn’t hang up a project or use it until it’s been dry for 24 hours. For Hard Coat, the recommended dry time is 72 hours. Since Hard Coat is typically used on furniture, wait for 72 hours before putting anything on the furniture. Does my bottle have a shelf life? The experts have told me two years if unopened. If opened, it will be about six months to a year. Is it food safe? Can I use it on a plate? Mod Podge is not food safe. It’s non-toxic, but becoming food safe requires a product to go through FDA approvals – not typical for art supplies. You should use decoupage on the back of a glass plate, and then you can put edible items on top. You can put Mod Podge on the top of a plate, but you’ll need to put a clear glass plate over that before putting your food down. I’ve heard you can make your own Mod Podge. Is this true? No. I’ve had more than a few readers e-mail me with a ruined project, very disappointed after having used a homemade formula. Please read the article I wrote about it here. Can I use Mod Podge with paint? Absolutely – well mostly. You can use it with acrylic paint, and I highly recommend FolkArt Acrylic Paint as my brand of choice. These days I'm loving their multi-surface formula. I do not recommend using Mod Podge with latex paint. I've never tried it, but I have more than a few reports telling me that decoupage medium makes the latex paint bubble up and causes a huge mess. So if in doubt, do a test. Where can I buy Mod Podge? Where can I buy it internationally? Mod Podge is available at AC Moore, Hobby Lobby, Jo-Ann, Michaels and WalMart. It is also available in smaller craft outlets and even online. I would call your local store to confirm stock, because inventory depends on the store. Also, if you are driving 50 miles to get some, you’ll want to make sure it’s in stock before you blow the gas money. Plaidonline.com has a store locator, but this is for stores that carry any Plaid product. Call to confirm that the store carries the formula you are looking for. Here’s a list of online retailers for Plaid product. And lastly, if you are overseas, you’ll want the international distributor locator. Where can I buy Mod Podge Dimensional Magic? Dimensional Magic is sold at A.C. Moore, Hobby Lobby, Jo-Ann and Michaels. I would also recommend doing an online search if you can’t find it at your local store – there are plenty of online retailers. You can also purchase Dimensional Magic on Amazon. What formula should I use for what project? I wrote a formula guide that you can find here. I’m on a budget and I can only afford one formula. Which one should I buy? This is a very hard question for me to answer, because it really depends on the application. But if you have to get one formula, I would get original Gloss if you want a shiny finish or original Matte if you want a flat finish (no shine). What formula is the most durable? Hard Coat. I use it for all of my furniture projects. What Mod Podge is best to use for an area of my home that will be exposed to moisture (bathroom, kitchen backsplash)? You can use the Outdoor formula, but you’ll need a sealer to go over it because this particular formula can remain tacky. I recommend Minwax Polycrylic or another brush-on sealer. You don’t want to use a spray sealer indoors. I want to make baby blocks that my baby/toddler can gnaw on. Which formula should I use? None of the Mod Podge formulas are food safe, so they are not recommended to be in a toddler’s mouth. Mod Podge is non-toxic, but it’s better safe than sorry. I have not found an acrylic product that I would recommend for this use. Is there such thing as colored Mod Podge? Can I tint Mod Podge with paint? There is no such thing as colored Mod Podge, but you can tint it with paint. You can even create a stained glass look with it. I made these clings that you can peel and stick on glass. Fabric Mod Podge is really tough, very durable AND it’s washable. So I always use it for projects that need to be durable – like clothing, accessories and furniture. If you are just Mod Podging fabric to letters and hanging them on the wall, you don’t need to use the Fabric formula. If you are using Mod Podge on fabric-to-fabric (for instance, gluing a patch to a shirt) then yes, you should use the Fabric formula because it is washable. Any tips for Mod Podging fabric/using Fabric Mod Podge? I always “prepare” my fabric before Mod Podging it down. This means I brush medium coat on, let it dry and then cut it to fit the surface. Applying the Mod Podge not only prevents fraying, but also makes the fabric more flexible and easier to adhere to the surface smoothly. Besides that, I treat fabric just like paper. The Fabric formula is a bit thicker than the Original formula, but used exactly the same way. Is Mod Podge Outdoor waterproof? You can’t submerge an item that’s been Podged with Outdoor for an extended period of time, so it’s not technically “waterproof.” But it’s really, really close. What tips would you give to a beginner? Start with a simple project. Purchase a $1 frame and a cheap piece of scrapbook paper. Watch this video. It’s got all the tips and tricks you need. Have patience. Don’t rush the project. Put the kids down for a nap and take your time. You MUST allow for proper dry time to avoid wrinkles. Practice. Don’t expect your first project to turn out perfectly. Mine didn’t, and now I can Mod Podge like a pro. Be kind to yourself. What is your Mod Podging process? How can I get the best results? You can watch this video, but here are my steps as well. I first prepare my surface by sanding wood, washing glass or tin, etc. I paint the surface with several coats of acrylic paint (if desired). Let that dry. I cut my paper or fabric to fit the surface – I typically use a ruler and craft knife over scissors to get the most precise fit. I apply a medium layer of my formula – enough so that it’s visible (white) on the surface. I apply Mod Podge to the surface as well as to the back of the paper or fabric. I work quickly since Mod Podge dries quickly. I smooth the paper or fabric onto the surface and roll out with a brayer. I let that dry for 15 – 20 minutes, then I decoupage over the top. Let that dry and then give the whole project 2 – 3 more coats. Let dry before using. How can I prevent wrinkles and bubbles? This is the #1 question I get – and it’s such an important question that I made this video. The key is using enough Mod Podge during application, and allowing the Mod Podge to dry long enough between layers. Please watch the video for all the details. PS – sometimes you’ll see wrinkles even if you follow my process, but many times they go away when the project is drying. My Mod Podge project is tacky/sticky when dry. What can I do? The Gloss formula is more likely to be tacky – the rule I’ve found is that the more glossy the formula, the more “tacky potential” it has. It really depends on the climate, drying time and a variety of factors. If you find that your Mod Podged item is still tacky even after drying, just use a clear acrylic spray or brush-on sealer on top. Though Mod Podge is self-sealing, the sealer gives your project an added layer of protection. Do I need to prepare a surface before Mod Podging it? Glass – Thoroughly wash in warm, soapy water to remove dirt, dust, and grease film. Then rinse in warm water and let it dry. Plaster – Wipe clean with damp cloth. Plastic – Clean with soap and water. You’ll need to test the surface though as Mod Podge doesn’t stick to all plastics (see the next question). Papier-Mâché – Wipe clean with damp cloth. Terra Cotta – Wipe clean with damp cloth. Tin – Wash with soap and water, then wipe with a white vinegar dampened cloth if it’s really dirty. What surfaces can I NOT Mod Podge on? Plastics, items coated with polymers and felt. Continue reading for detail. Plastics. You’ll need to test the plastic first with a small square of paper or fabric. Mod Podge the paper/fabric down and let it dry for 15 minutes. If it peels off really easily, it’s not going to work. If it is more difficult to peel off, then you should be safe to Mod Podge the item. You’ll still be able to peel off the Mod Podged paper/fabric, so don’t worry about ruining the surface. Items coated with a polymer, like Teflon, are too slick. Felt. It feels really rough when it’s Mod Podged, plus it soaks in and you have to glop a lot on. Touching Mod Podged felt gives me the yips! This is just personal though – you might not mind Mod Podged felt. I want to decoupage photographs. What do I need to do? I don’t use original photographs; rather, I make photocopies on a laserjet printer so that I can preserve the originals. The other reason I don’t use original photos is that they have some thickness to them as well as a coating – both things make them a little bit more difficult to Mod Podge. I like my Mod Podging as flat as possible. If you want to go ahead and use photos, just make sure to use a lot of Mod Podge, because it takes more than normal. You’ll have to hold the photos in place for several minutes after you apply the Podge, so that they don’t come up. If you want to make copies or computer printouts of your photos, see the next question. I want to Mod Podge computer printouts – how do I handle inkjet versus laserjet prints? Inkjet ink bleeds, laserjet doesn’t. Here’s what you need to know. First of all, don’t print anything on photo paper. Regular printer paper is best because it doesn’t have a coating on it. I use 20 lb. paper, but you can go thicker if you need to. Inkjet – Print the picture onto the paper and let it dry for at least ten minutes. Spray both sides of the paper with clear acrylic sealer (several coats) and let it dry. Paint with a thin layer of Mod Podge on both sides, then let it dry. Then you can craft as normal. It sounds like a lot of steps, but it’s not that difficult – you just have to make sure it all dries. Laserjet – no prep work necessary. I always user laserjet printouts, even if I have to go to an office supply store to get it done. Maybe I’m lazy? How thick should each coat of Mod Podge be? I use a “medium” coat when applying one surface to another. By medium, I mean that I can visibly see the white completely covering the surface. If it’s clear in some areas before you apply paper, it means the Mod Podge has already dried and the surface needs more. You are better off applying too much than not enough, because you can always wipe away excess. Not enough will cause wrinkles. The coats to seal don’t need to be as thick. I would use a few thinner coats to seal your project. I would use two – three coats to seal a project. You’ll want more coats depending on how much the project will be handled. If it’s a piece of furniture under heavy use, I’d even go up to five. How many coats of Outdoor Mod Podge should I use? I recommend four – five coats for a project that is going to be outdoors. If the project is going to go through some serious weather conditions, you should also purchase an outdoor sealer for added protection. How should I smooth out paper? I recommend a brayer and squeegee like in the Mod Podge tool set. The brayer is good for big, flat surfaces and the squeegee gets into corners. Are there certain types of papers that don’t decoupage well? So far the only items I haven’t been able to Mod Podge smoothly are tissue paper and napkins – but I have seen people decoupage these smoothly, so I know it can be done. I guess I just don’t have the finesse? I would say that you should try it, and don't be discouraged if you get wrinkles. They add character! If you are a newbie, start with thicker scrapbook papers before moving to thinner. Once you get the hang of it, you will be able to move to the thinner papers. Don’t forget to check out my video on eliminating wrinkles. How should I handle Mod Podging edges of a project? I always trim my paper or fabric to fit my surface exactly so that I don’t have to mess with overlap. It’s can be very difficult to trim edges of paper or fabric after a surface has been Mod Podged. In terms of Mod Podging edges, just add more Podge around the edges and wipe away with a brush. It’s a good idea to do around the edge of any project to finish it, especially furniture. How can I minimize/eliminate brush strokes? Use a soft bristled brush and then sand between coats. To do this, apply the Mod Podge and let it dry an hour. Then use #0000 steel wool and lightly sand the entire surface. Do this between every coat. After the final coat, sand and then spray a clear acrylic sealer to finish. Can I use a blow dryer on my project to speed up the drying process? Yes, but keep the blow dryer back at least 12 inches and don’t use an uber-hot setting. You will definitely melt your project or the Podge if you get too close or use too hot of a setting. Do I have to use a sealer to finish the project? You don’t HAVE to use a sealer after Mod Podge (it’s self-sealing), but I always do, just for extra protection. Plus sometimes Mod Podge stays tacky in certain climates, so I spray it to prevent that. Any clear acrylic spray sealer will do (the Mod Podge brand sealers are good) . . . though if an item is going to be exposed to water, you’ll need to use a waterproof/enamel sealer. Wait about an hour for Mod Podge to dry before applying any additional sealer. What sealer should I use with coasters or other items that need to be waterproof? There are waterproof/enamel sealers on the market (ask at your local hardware store). I’ve also heard that Minwax Polycrylic is amazing for sealing and making Mod Podged items waterproof. Do you know of a good non-toxic sealer I can use? Most spray sealers have VOCs, which are fine if you aren’t spraying them into your mouth or nose. But if you want something super-duper safe with no VOCs, use this. Get my list of essential decoupage supplies here. What type of brush should I use to apply Mod Podge? You can use regular taklon or natural bristle brushes found at your local craft retailer. I use a soft bristled, 1” brush in most instances. Sometimes I go smaller, but the 1” brush works for most of my projects. A foam brush can also be used, but I find that my soft bristled brush minimizes brush strokes. What brand do I personally use? FolkArt or Martha Stewart brushes. Great quality, great price. What is the best way to clean brushes? Do I need to use a new one each time? You should always wash brushes immediately after Mod Podging. Regular brush cleaner or non-abrasive soap works very well for cleaning brushes. You don’t need to use a new one each time as long as you wash the brushes out thoroughly before anything dries. What should I do if Mod Podge dries in my brush? You can try soaking it in hot water to see if you can salvage it, but you’ll likely have to throw it away. Why do I need a brayer/Mod Podge tool set? I use a brayer for larger items – like tabletops. I can apply more force to smooth and work more quickly than if I just used my hands. The brayer just glides across the paper or fabric, so you can get everything flat before it dries. I need to send a Mod Podged project to someone – how do I pack it? I recommend using Glad Press N’ Seal around the entire project before packing it. Wax paper also works, I just like Press N’ Seal because it’s easier to press around edges and round surfaces. Mod Podge smears my marker/stamping ink. What can I do? Spray both sides of the paper with workable fixatif (several coats) and let it dry. Paint with a thin layer of medium on both sides, let it dry. Then you can decoupage as normal. It sounds like a lot of steps, but it’s not that difficult – you just have to make sure it all dries. I actually wrote an article about this very thing here – you need to check it out! Decoupage smears my inkjet printouts. What can I do? Spray both sides of the paper with clear acrylic sealer (several coats) and let it dry. Paint with a thin layer of your selected formula on both sides, let it dry. Then you can decoupage as normal. It sounds like a lot of steps, but it’s not that difficult – you just have to make sure it all dries. What if I finished my project and sprayed with a sealer – only to realize I forgot to add something – can I decoupage on top of the sealed surface? Yes, you can. But you will need to re-Podge the entire surface. Otherwise you’ll be able to see where it’s Mod Podged versus where it’s sealed. Is it possible to ‘un-Mod Podge' something once you have Mod Podged it? If it’s completely dry, the answer is “sort of.” You are going to have to wet the Podge and scrape it off. Mod Podge is tough. For instance, you can remove it from a tabletop, but I would mist it with water and then let the water soak in. Then I would scrape the paper (or whatever it is) off of the surface and try the water again if I didn’t get it all. Then you have to sand. For some surfaces like paper and fabric, the answer is likely no. Those are hard to salvage. If the Mod Podge is still wet, you might be able to. Peel back slowly to see if it’s going to work. Can I use Mod Podge to preserve scrapbook pages or photos? Because of water sensitivity, it’s not recommended that you use for preservation purposes. What's the hardest thing you have ever Mod Podged? A frame that was an odd shape, if you can believe it. It was hard to cut the paper, and then it didn’t fit right within the recessed area, so it was doomed from the beginning. Once I Mod Podged, it was all over because the paper wrinkled like crazy. That frame went into the garbage. I want to layer papers on a desktop. How do I keep it smooth or should I just expect to feel the edges of each paper every time I touch the desktop? If you layer papers, then you will definitely be able to feel where they cross over, just because papers have thickness. If you don’t want layers, you can do a patchwork effect on the top of the desk, kinda like this. I would love to know what is your favorite Podge product? It’s a tie between Hard Coat and Dimensional Magic. I love the satin finish of Hard Coat and Dimensional Magic is just . . . cool. Is Mod Podge paintable? After I do a project and want to add some additional color can I paint on top of the MP or will it ruin it? Yes, you can definitely paint on top of Mod Podge. I’ve only done it with acrylic paint, but it worked. You will have to seal the paint with more Mod Podge over the top though so it doesn’t come off. When I MP my small pieces, it always sticks to my fingers and ends up being messy, booger-ish blobs that sometimes stick to my work. Is there a trick to keeping hands clean and free of MP “boogers”? You can 1) use tweezers, 2) wear gloves or 3) wash your hands frequently. It’s a glue, so that is where the sticky boogers come from. I get them too. Will my project yellow over time? Yes, it does yellow over time. But it takes a long time, and it’s very slight. I’ve had things for years that are not yellow. Good luck Mod Podging! You are, without a doubt, going to love it. And let me know if you have any more questions! !